Growing chives (Allium Schoenoprasum) in pots is common for kitchen gardeners, but they grow just as well in the ground. Chives are perennial alliums that produce for many years. 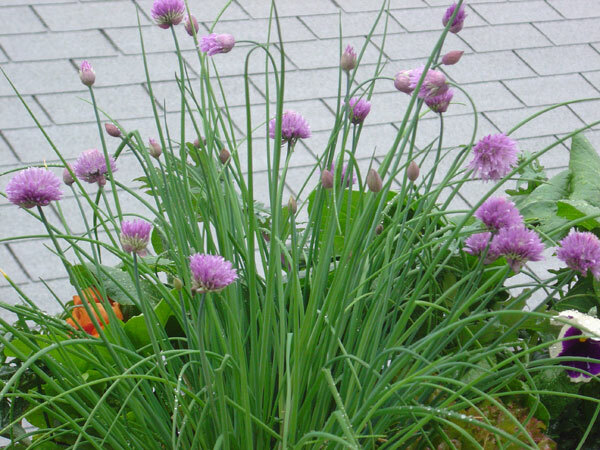 Growing chives right outside your kitchen gives you ready access to a mild onion taste any time you need it. Snip leaves and chop finely to add to soups, salad dressings, scrambled eggs, and pasta dishes. Chop and add to softened butter to put on baked potatoes or toast. In the garden, chives make an attractive addition to borders and rock gardens. If allowed to flower (not advised for plants you plan to cook with), 1" (2.5cm) pink flowers will crown many of the stems. Honey bees, bumble bees, and native pollinators love chive flowers. Chive flowers are edible, and make a beautiful garnish, but letting chives flower reduces leaf quality and production. There are two primary types of chives. Common Chives (Allium Schoenoprasum) are the chives cooks and gardeners are most familiar with, but Garlic Chives (Allium tuberosum), a flat-leafed variety with a mild garlic taste that's popular in Asian cuisines, are also readily available in local nurseries, both as seeds and plants. Common chives are thinner and finer than garlic chives, and have pink flowers. Garlic chives have flat leaves and white flowers. They grow larger and need a bit more space in the garden. Both are excellent in containers. Chives are frost hardy, but they grow very slowly in cold temperatures. In areas with severe winters, cut the plants back to 2" (5cm) above the ground in the fall and mulch with 3" (7cm) of straw or coarse wood chips. When growing chives, it’s best to sow seeds directly. Broadcast seeds, or sow in rows 8-10" (20-25cm) apart. Press the seeds into the soil so they make good contact, then cover with ½" (1cm) of soil or fine mulch, and water. Keep the seed bed evenly moist until germination, which should take 7-18 days, depending on temperature and seed age. Chive seeds, like most allium seeds, lose viability rapidly, so plant seeds the same year you buy them. Germination rates decline very rapidly even in seeds that are stored well. Soil Needs: Chives thrive in any fast-draining garden loam. Amend soil for growing chives with 2" (5cm) of good garden compost or composted manure, and improve drainage in clay soils by adding coarse sand, perlite, or fine gravel or lava rock. See Improving Clay Soil for more information. Add alfalfa meal, soy meal, worm castings, or composted chicken manure at the time of planting for a more luxurious crop. Finely crushed eggshells, oyster shell flour, or hardwood ashes (1-2lbs per 100 square feet) [1/2-1kg per 3 square meters] should be added to help neutralize acidic soils. Plant Spacing: Thin chives to 4-6 shoots per clump, and space clumps about 8" (20cm) apart. Watering: Regular watering produces larger, more succulent leaves. If you’re growing chives as a landscape plant or to attract beneficial insects, water less frequently to induce flowering. Fertilizing: If you build organic fertilizer into the soil at planting time, subsequent feeding isn’t necessary until late in the season. However, if you cut the chives frequently, give them a shot of fish emulsion, compost extract, or compost tea to encourage re-growth. Plant Care: For culinary use, keep flowers from forming by clipping flowering stalks down to the ground. Flowering makes the plant leaves coarser and less flavorful, as nutrients are pulled from the leaves to support flowering and seed production. Divide 2-3-year old chive clumps to keep them productive. Transplant the divisions elsewhere, or give them to friends. Chives have few pests or diseases. Aphids may be seen at the bases of flowers, or on plants that are dying back before going dormant in winter, but they’re rarely a problem. Wait for natural controls to check the population, or spray with a mild soap spray (2-3 drops of dish soap in 1 quart of lukewarm water). Growing chives in containers and window boxes is really the best way to grow them. They can be grown right outside your kitchen, then, when it starts getting cold in the fall, bring the entire pot indoors, and set in a sunny window to keep a supply of chives growing through the winter. For a 12" (30 cm) pot, add 1/2 cup alfalfa meal or soy meal, or 2 cups of worm castings, and mix thoroughly. If you’re planning to bring the plants indoors through the winter, choose a 6-8" (15-20 cm) pot, but be aware that smaller pot sizes dry out quickly in summer heat, so they’ll need more frequent watering. Keep them in partial shade during the summer to reduce evaporation. Use an organic potting mix from a local garden center, or make your own, following this recipe. Amend with 1/2 cup alfalfa or soy meal per 12" (30 cm) pot, or 2 cups of worm castings. Harvest Chives by snipping the leaves off 2" (5 cm) above the base of the plant. New leaves will sprout to fill in the gap. Chives can be chopped finely and frozen (with a little water to cover) in ice cube trays; pack the chopped chives into the tray cell to press out air before adding water. Turn the chive cubes out into a freezer bag or container, label them, and put them in the freezer door where they're easy to get to. Add cubes to soups or sautees as needed. Chive cubes will keep for 3-4 months in the freezer. Chive Butter is a great way to preserve chives. Mix 2-3 Tbs of finely chopped chives into 1/2 cup (1 stick) of softened butter. Use on baked potatoes or toasted bagels. Chive Vinegar can be made by steeping whole chive leaves in your favorite vinegar. Chive vinegar is a natural for salad dressings and vinaigrettes.